We’ve all received that dreaded friend request – the one where you didn’t fall out of touch, you stopped calling on purpose. Clicking the ignore button is easy and has few consequences. It can get tricky when you have to see the requestor every day at the office – how do you handle it when colleagues or clients send you friend requests? With more and more companies writing social media policies, it’s becoming one of the thornier questions to consider. Note – although this is written from the perspective of drafting policy, I believe that the observations are also valid for individuals considering their own approach in the absence of a relevant corporate policy. As a starting point for the analysis, there are two distinct views of the world. Facebook may provide opportunities for your business and we should consider if it is an appropriate tool to do so. This is a legitimate view and taking this position does not suggest that you’re ignorant of the potential of social media. 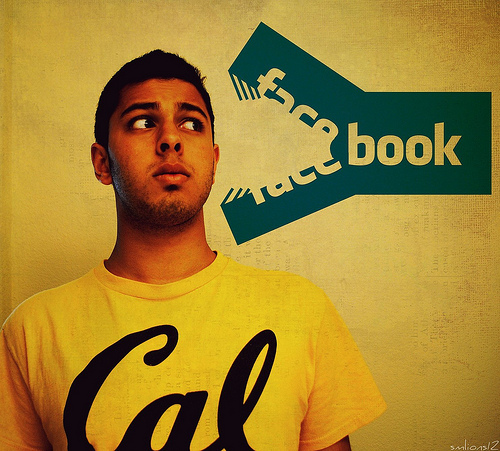 In many organisations, there is a line drawn between professional social networking (e.g. LinkedIn, Xing and perhaps Plaxo) and personal social networking (Facebook, MySpace, etc.). Recognising this distinction (in policy) and encouraging staff to use professional social networks rather than personal ones is a mature and considered position. It provides a clear guideline to staff as to corporate expectations. Additionally, by recognising professional social networking as legitimate and of benefit to business, it provides a platform for employees to connect with business contacts on the engaged web. As we all know however, the lines between business and personal tend to blur over the course time. It’s not uncommon that colleagues and clients become friends as well being business connections. Forcibly creating a separation may harm both your personal and professional relationships with these people and that is counter to the very principles of using social networking. Would you use your evenings and weekends to spend time with the people who have friend requested you? i.e. are you seeing them socially outside of work activities? If these people saw a video of you pulling your “famous robot dance moves” at a party, would it harm your business or your professional relationship? i.e. have they transitioned from colleague / client to friend? It will always remain a grey area. If the employee feels they want a separation between personal life and work life or that their Facebook profile reveals something personal that would harm their professional relationships, having a clear separation policy provides context for a quiet conversation where they suggest to the person that they connect on LinkedIn rather than Facebook. Taking the view that you want to use Facebook for networking with clients and colleagues can be both risky and rewarding. There is potential to open up new networks of people for business but there is also potential for those drunken Ibiza pictures of your sales team to undermine your market credibility. There is one important consideration to bear in mind though: Facebook profiles belong to your employees, not to your organisation. A Facebook profile is a personal representation of self and – with the exception of reasonable controls around employer and client data protection – I don’t believe it is reasonable for employers to restrict, control and monitor their employee’s Facebook profiles. This is something I’ve written about before in the context of LinkedIn. Bearing this in mind, choosing to use Facebook for professional networking is a significant leap of faith and this needs to be recognised. 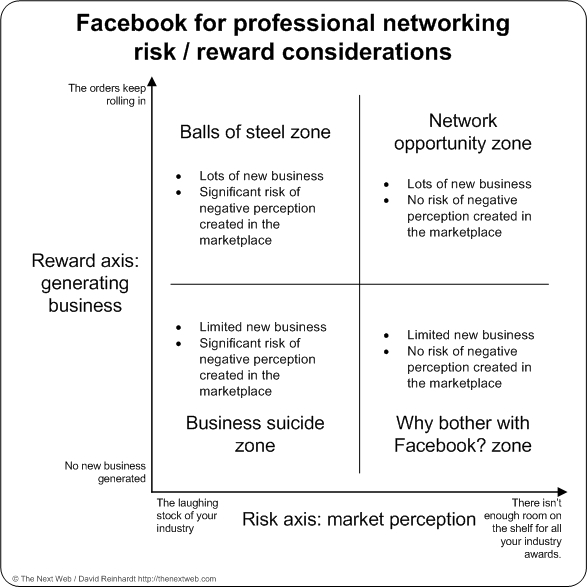 In time honoured management consulting fashion, it can be handy to visualise your risk / reward on 2 x 2 matrix. On the vertical axis we consider the potential reward i.e. generating new business. On the horizontal axis, we consider the potential risk, i.e. that those drunken sales team photos from the team away day can do significant damage when potential clients see them. Considering the business suicide zone is also reasonably straightforward. Risk, likely to be realised, significantly outweighs reward. In this zone, A wise policy position would be to use policy to draw up a Facebook / LinkedIn distinction. The balls of steel zone begs some tough questions. There is opportunity for your business but the risks are high. Perhaps this is a medium or large sized organisation who may be to drive sales from a large network of people but recognise the potential for catastrophic publicity? Corporate appetite for risk will drive policy makers in this zone, with the reflection that ideally, positive encouragement of employee’s online behaviours will drive the business into the network opportunity zone. Encouragement, not enforcement. On the face of it, the why bother with Facebook? zone seems reasonably straightforward. Why incur potential risk with limited reward? The only potential driver may be a belief that this is transitory and there is potential to move into the network opportunity zone. Ultimately, your decision (either personally or as an organisation) will be driven by two factors. Firstly there is the question of whether you want to reveal your personal self to your professional connections. If you’ve decided to do this, then there is the risk / reward consideration of whether encouraging Facebook for professional networking is likely to be of benefit balanced against your perception of the risk and your appetite to carry it.